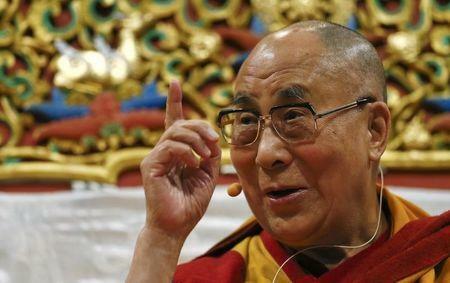 COLOMBO (Reuters) - Sri Lankan Buddhist monks have invited exiled Tibetan spiritual leader the Dalai Lama to make his first visit to the island, after a strongly pro-China government was voted out in January, but an official said Colombo was unlikely to allow it. Sri Lanka's new President Maithripala Sirisena has loosened ties with Beijing and moved closer to India, which has hosted the Dalai Lama since he fled Tibet in 1959. But the majority Buddhist island, which is home to some of the religion's most sacred sites, still depends on China for major development investment and loans. "They can invite, but the government may not grant a visa," a top foreign minister official told Reuters, asking not to be named because of the sensitivity of the subject. "The Dalai Lama is very important. But the close relationship with China is more important and we have not changed our stance on 'One China' policy." The invitation to the Dalai Lama was extended by a group of high-ranking Theravada monks from Sri Lanka's Mahabodhi Society when they attended a theological discussion in late March with Indian monks in New Delhi, senior monk Banagala Upatissa said. Upatissa said the Dalai Lama told him he had wanted since childhood to visit a Sri Lankan temple housing a relic of Buddha's tooth, and Mahabodhi, which contains a descendant of the tree under which Buddhists believe he attained enlightenment. "He told us that all others in the world - Christians, Hindus and Muslims - treat him well. But his own Buddhist brotherhood does not treat him well," Upatissa told Reuters. "We felt saddened and disturbed and invited him to visit Sri Lanka. I hope to discuss with the government to find a solution for this. Without antagonizing China, we are trying to get him a visa as an ordinary monk and not as a state official." India, where Buddhism was founded, and China, with the world's largest Buddhist population, both portray themselves as protectors of the religion. "We will be very happy if we can fulfil the Dalai Lama's desire," he said. "He is a Buddhist brother of ours who follows the teachings of the same Lord Buddha."